Part of the crown jewel of riverfront parks, Maurie Jacobs offers lovely views of the river and with its expansive turf is an ideal location for soccer, ultimate Frisbee, and other field games. 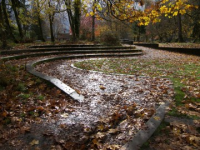 The park is also a lovely spot for a picnic, with a small play area surrounded by a comfortable plaza and a scattering of picnic tables and benches, many of which are situated beneath the shade of large trees. 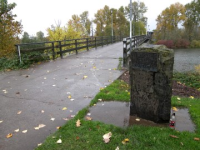 The Greenway Bridge, which provides the zero base mile marker for the Ruth Bascom Riverbank Path system, leads pedestrians from the South and West Bank paths across the Willamette River to the North and East Bank paths.